Holiday.gr - Imerovigli, a trip to a myth! The beautiful Imerovigli impresses every visitor with its authentic charm of Cyclades, the traditional architecture of its houses and churches and with the magnificent view of the caldera and the volcano, is a pole of attraction for every traveler who wants to live a dream. 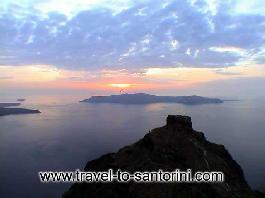 Imerovigli is very near to Fira and only 1 km away from Firostefani, the last settlement of the capitol. It is situated at the highest point of the rocks, at a height of 300m. Its’ traditional habitation- which has been indicated as conserved – and the marvelous view have inspirited many artists. During your tour in Imerovigli you’ll be able to see in a very romantic site the remains of the Venetian castle “Skaros” which was built by the Venetian Lord Marco Sanoudio. As you follow the path that begins from “Skaros” you will find the little church of Theoskepasti. Built on the edge of a rock has unique view to the volcanic islands Old and New Kameni. 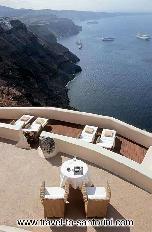 In Imerovigli you can find many hotels and studios for all tastes and budgets. Chances for entertainment are numerous. Been to Imerovigli ? Share your experiences!